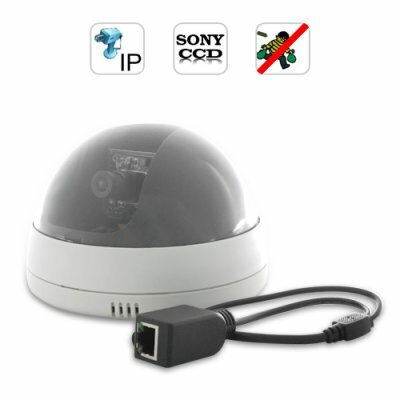 Successfully Added IP Security Camera (Sony CCD, Ceiling Mount) to your Shopping Cart. New ceiling mount IP security camera with 1/3 Inch SONY CCD, that is lightweight, durable, easy to install and can be instantly accessed from anywhere around the world. Protect your home/business and watch over your loved ones or monitor your employees with this vandal proof, top of the line IP camera while you are away. Sheltered inside a durable, scratch free, ultra transparent protective polycarbonate shield, the high quality 1/3 Inch SONY CCD image sensor provides you with an impressive image quality you normally only see with $600 professional surveillance cameras. With the I63 IP Camera you get no blurry pictures or distortion, just clear images of every detail and every person in sight, whether you are viewing them from the next room or half a world away! With built-in web server function, simply type in the Security Camera IP address and you can get instant access to its full range of DVR functions like real-time video surveillance, setting up a recording schedule, capture still image or video, setup motion detection, email and FTP alerts, and much more! Offices: Who is sleeping during working hours or who is stealing office supplies? With many useful applications and our famous 12-month satisfaction warranty, this product is a must have for all of your security/surveillance needs. At a fraction of the price you expect to pay for similar "brand name" IP cameras, this is an immediate must buy for anyone worried about safety. Click on "Add To Cart" right now and we will express ship yours out tomorrow - guaranteed! To help transfer images with good speed and quality, captured video is compress in H.264 standard to save bandwidth and minimize lose of detail. Is this IP Security Camera like ones I have seen from Samsung/Panasonic/Vitek/IQ/Messoa ? Yes, it is the same as those, except the I63 comes with a factory-direct low wholesale price, meaning it only costs 1/3 the price!